This one has been a long time in the making, even by my standards. It was intended for a male friend’s fortieth birthday and that friend is now 42. It’s a good thing he got an interim gift to tide him over. The quilt is made using a Robert Kaufman Roll-Up, comprising 40 strips and equivalent to 2.8 yards, according to the label. I was disappointed at how ‘thin’ the strips were – they barely measured 2 1/2″ wide even at the pointiest bit of the zig-zagged edge and I had to adjust my cutting to allow for this. I wasn’t happy about that. I used the Mineral Mining Colorstory (RU-182-40) and feel happy that it looks manly. The blue is homespun from my stash, bought originally at Spotlight. Next time I’d make the blue frame a little narrower. The Pam & Nicky Lintott pattern didn’t call for a border but I wanted to make a visual separation between the batiks. My friend has a black leather couch, which is why I chose the black batik border and used the same for the backing. I hope he likes it. Just a short post today, almost a ‘proof of life’ post. Last weekend I finally managed to get some sewing done, something I hadn’t been able to do for several weeks. I’m working on another friendship braid quilt, using a Moda jelly roll. I spent two weekends cutting the pieces, aiming for accuracy rather than speed. Now that I’ve started sewing, the tempo is picking up, with two braids done and two more well on the way. In fact it’s coming along so well that I’ve already had a look through my stash for border and backing fabric. I wish I had more time for craft, but right now I don’t. So I’ll just keep doing what I can, when I can, keeping in mind that this particular quilt is intended as a gift for a birthday in January. Seven months. Should be doable. I hope. 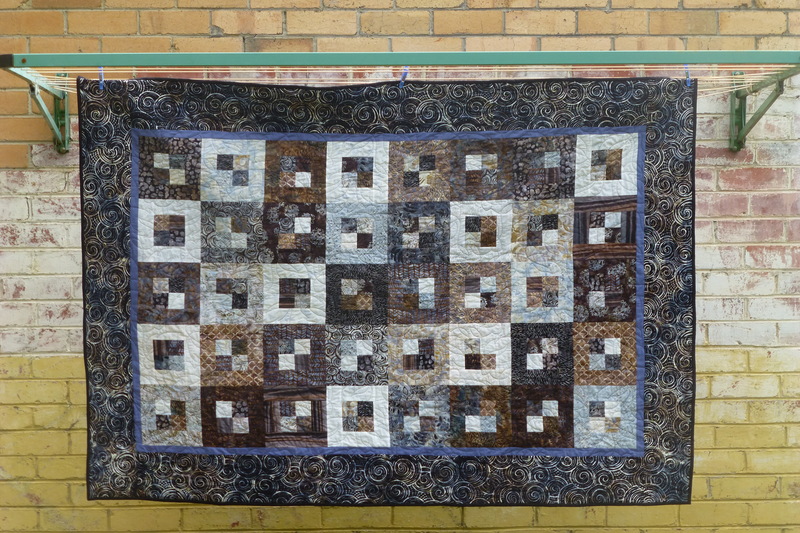 Here is another quilt based on Pam & Nicky Lintott’s Jelly Roll Quilts book. The two colour border was my own minor variation. I like that the burnt orange border hints at ochre, and in turn Australian Aboriginal art. OK, so that’s probably over-analysing it a bit but it’s how I see it. The border colours were something I settled on after my original border fabric candidate failed the audition. This one has a ridiculously long history. I started it way back in December 2010, as a birthday gift for a friend. It didn’t get finished in time for her birthday but went to the party anyway. I should point out that she got a handmade gift crafted by my beloved instead, so she didn’t miss out. Now it’s going to be a gift for our friend Andrew. Hope you’re reading this Andrew. Andrew has a small but treasured collection of Aboriginal art and I’m hoping this quilt will fit in with the decor at his warehouse apartment. A couple of details: The reverse is black and gold. 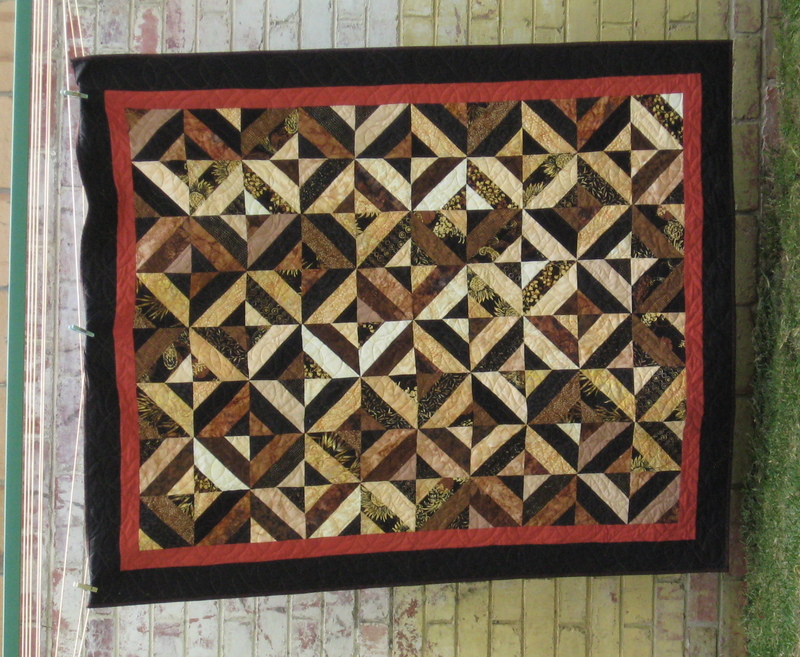 The long arm quilting is by Pam Hammer. I had to hold off on publishing this picture until after our family celebration on Christmas Eve, as I gave it to my sister-in-law as a Christmas gift. 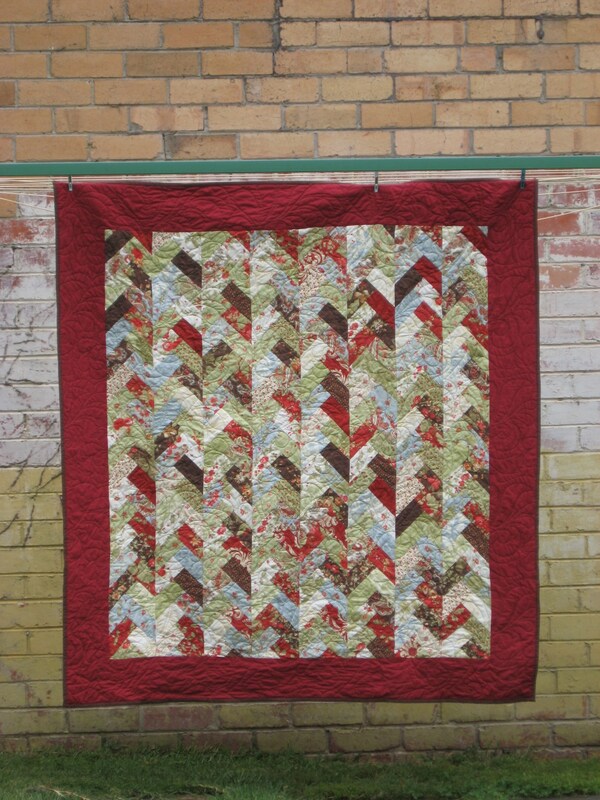 The design is from Pam & Nicky Lintott’s Jelly Roll Quilts book, the long arm quilting by Pam Hammer. For the first time ever, I washed the quilt before gifting it. I know many quilters do this routinely, but I don’t. It does change the appearance of the quilt a little but as I wash both my fabric and batting before starting a quilt I don’t get much of the pillowing that many quilters love. I chose a chocolatey brown for the binding and it is hand-sewn on the reverse. It seemed a long way round and I had to really persevere to get the hand-sewing done, doing a little before work in the morning and a little more after work in the evening. It’s good to be reminded that perseverance and doing a little bit every day will get the job done. My next task is to apply that principle to cleaning up my sewing/guest room in preparation for my houseguest’s arrival next month. I have three more quilts to complete before she arrives, the cot quilt, the garden trellis and the coin quilt, which I’m not liking any more than I did when I first completed the top. The braids have been coming along nicely and I’ve been enjoying sewing them by the window, keeping an eye on the garden. It’s that time of year when you can just about watch the garden grow. We’ve had warm sunny days interspersed with rain, which is about as good as it gets. Of course weeding and planting does compete with sewing time, but when we eat a meal of home-grown asparagus, it’s all worth it. Sewing the braids together was easy enough once I’d worked out the order – you have to alternate the trapezoid/reverse trapezoids and that had me confused for a while, just as it did when I started the braids. I cut the ‘tails’ off after I had the seams sewn. It just seemed to make sense to do it then. Next step is to add the borders. I’ve cut the fabric so I’m hoping the top will be done within the next day or two. 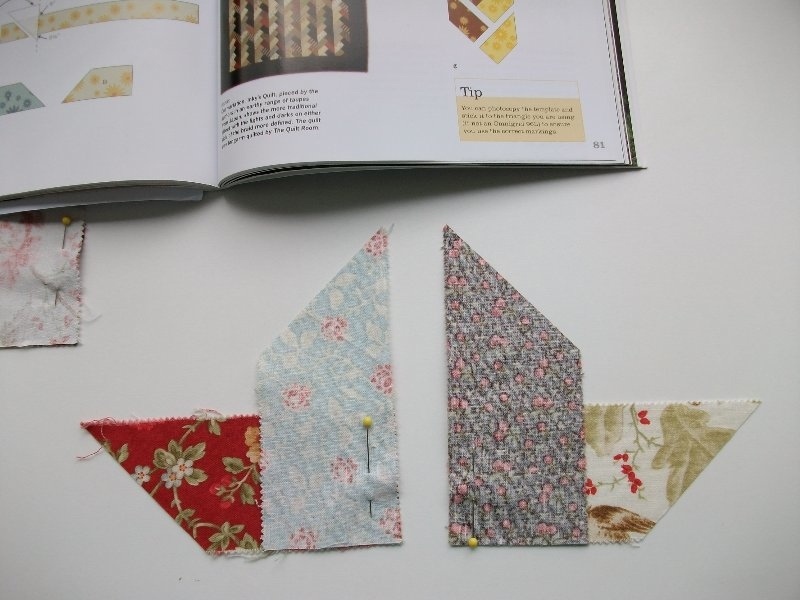 I know from the search terms that bring readers to this blog that I’m not the only one working on the Friendship Braid quilt from the Jelly Roll Quilts book. The braids are, as they say in the book, quite quick to string piece once you get started. I found that to be the case and was able to complete a braid within a few hours on a day when I didn’t have to go to the office. Getting started is a whole other story though. That made my head hurt and there was some unpicking in the mix, too. The illustrations in the book aren’t quite to scale and the use of colour in those illustrations didn’t help, because it wasn’t clear to me which they were treating as a light trapezoid and which as a dark. So I thought I’d share my photos, in the hope it might help someone else. 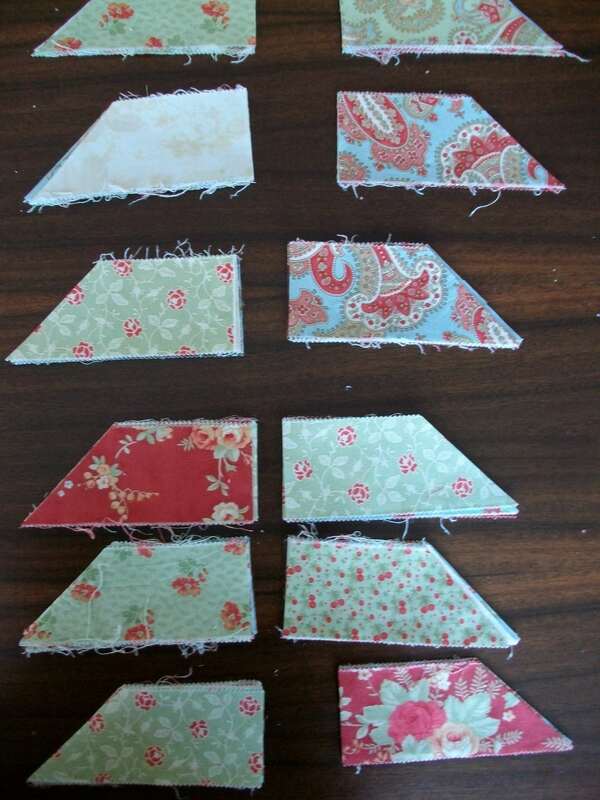 The outside edges should be parallel when you’re done sewing as shown by the hand drawn lines on the second photo. I eventually learned to check for that before sewing. 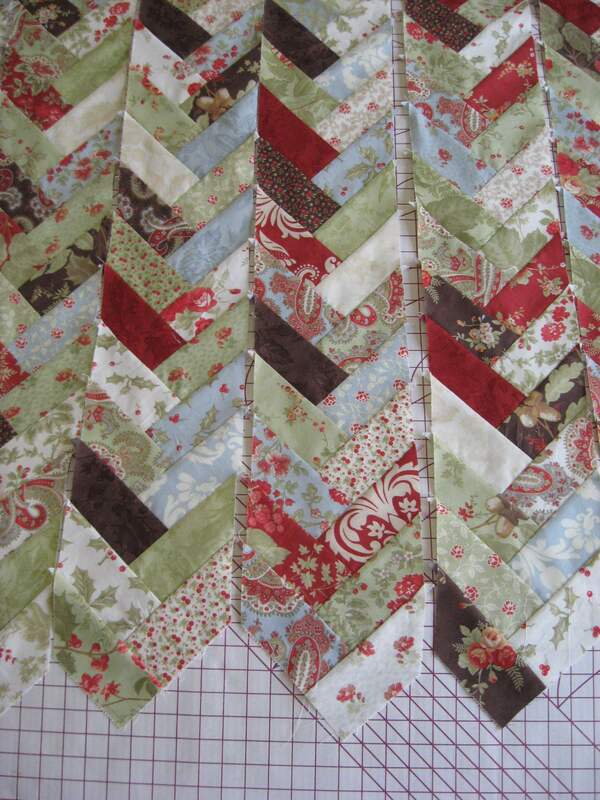 Today I started cutting the pieces for the Friendship Braid quilt from the Jelly Roll Quilts book. I’m using a Moda jelly roll, which I pre-washed by throwing it in a normal wash in a delicates bag. 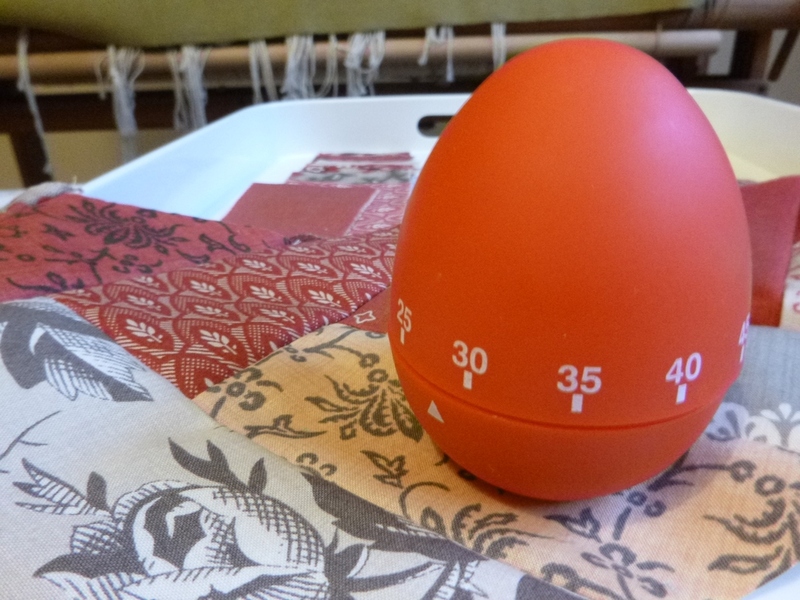 I prefer to pre-wash all my fabrics rather than risking colour bleeding or shrinkage after the quilt has been pieced. 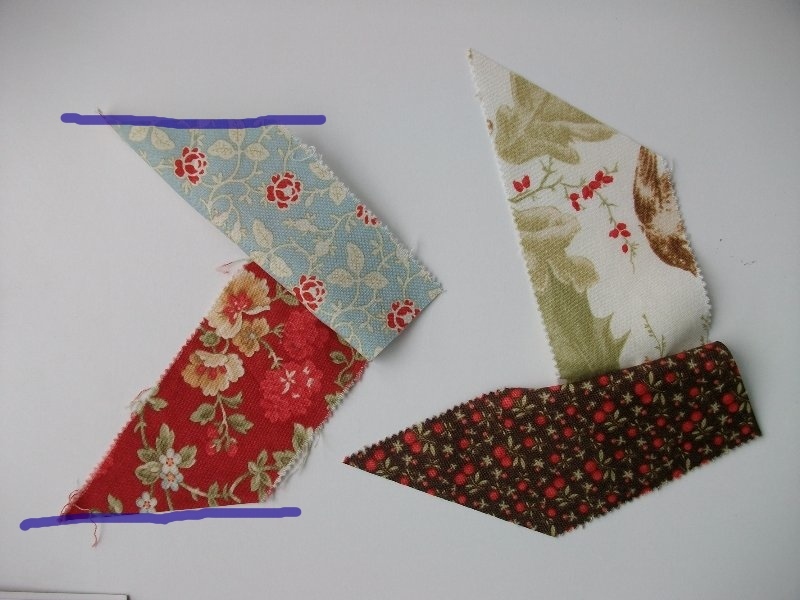 Based on the fact that everyone has their own recommended approach, I’m pretty sure there isn’t a right or wrong way to prepare quilting fabric. I routinely wash it but I don’t starch and I don’t use fabric softener. Quilting fabric goes in with the family laundry, with a colour catcher added if I feel there’s a risk of dye running. I pre-wash batts, too. I put them in my front-loader on a wool cycle, with no laundry detergent and they hold together just fine. I prefer a smooth quilt over a puckered one and I don’t generally re-wash before gifting or using the quilt, so it’s good to have all the washing out of the way up front. The clothes airer works brilliantly for drying the jelly roll strips. I wouldn’t dream of using the drier for them – way too much wear and tear. I suspect I wouldn’t have any fabric left to sew if I used the drier. The strips do get a bit hairy in the washing machine, but I can live with that. The cutting for this quilt was a little tedious. The hard part was making sure to cut trapezoids for the lighter shades and reverse trapezoids for the darker shades. From time to time I got that part wrong and I’m going to argue it was deliberate, to break up the colours a bit and add visual interest. Other than that, you line up your Omnigrid 96L, using the 2 1/2 and the 5 inch lines as references and cut away. 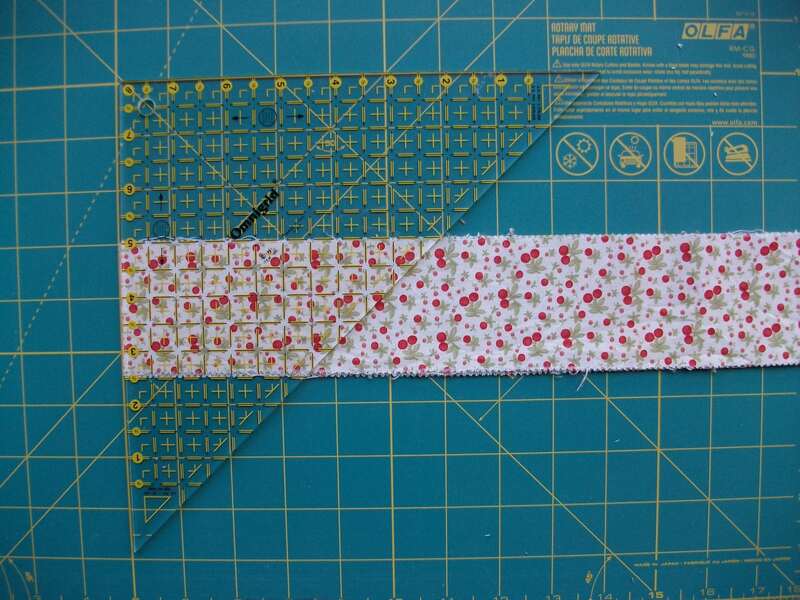 There’s not much room for error as you don’t get a whole lot of fabric left over at the end of each strip. If I really had to re-cut a trapezoid I could probably find a scrap long enough, but I’d have to audition a few off-cuts before I did. Eva Stossels Weaving Blog Some good weaving tips and ideas. Warped for Good Faith is an ever present element of this weaver’s life – she has a Glimakra loom and a lot of tips to share. Camille Roskelley's Simplify Three Little Boys and Amazing Quilt Designs. How does she do it?